As I stood in line, making conversation with the people around me, I found out the line was for ALL of the ticketed autographs, not just Bradbury. A sense of relief fell over me. As the line finally began to move, we actually felt like we were running. The fast pace line then broke off to many smaller lines in the sails pavilion. It was here I stayed for about an hour continually going through the line in attempt to pull a bunny out of a hat (well, a ticket with a bunny stamp on it from a felt bag). The people in this line were pretty awesome. After they had scored a ticket for themselves, they went back in the line to try for a random stranger who had been standing in line for a long time. By the end, I had two people pulling for me… but it wasn’t enough. Well, the session was the real reason I came so the disappointment was not gut-wrenching. 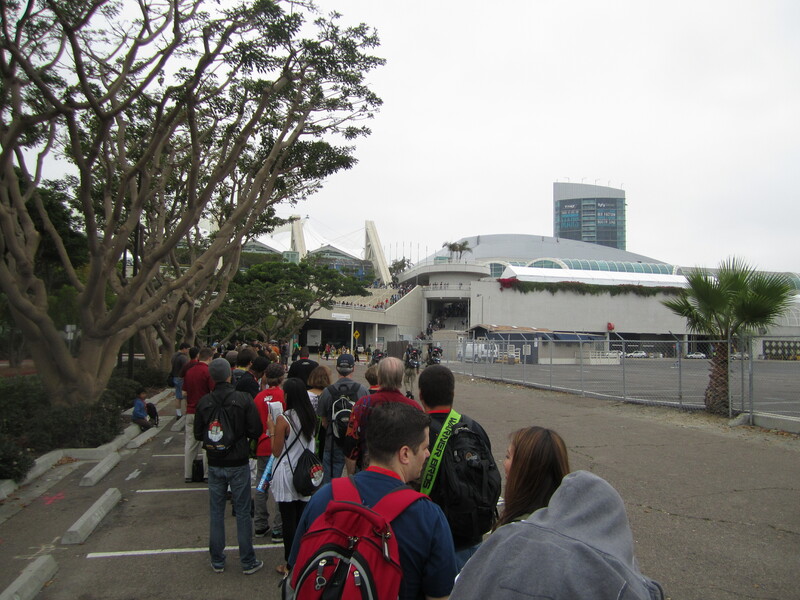 After hanging around the exhibit hall for a few hours, I went to secure my place in the surprising non-existant line. Well, I was there three hours before the session. So I managed to get a little writing in before jumping into a session with an unknown panel (at least to me). The panel after that was from the Cartoon Network. With each panel, I moved closer to score an awesome seat front and center (plus two for my friends). I am sly. 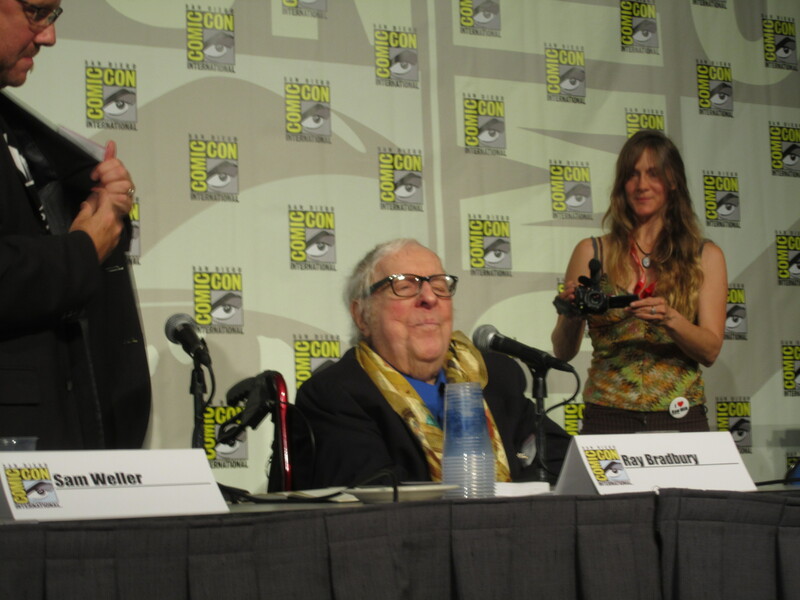 When Ray Bradbury was lifted on stage, the crowd rose and cheered for the man who was clearly the hero of the day. My heart soared and the tears already started to well. Sam Weller took his seat right next to Bradbury, cozied up like father and son. A short video of interviews Weller conducted shared Bradbury’s mental capacity and drive in his old age but also his frailty as his hand wavered in signing on of his books. Weller has had the privilege to spend quality time with Ray Bradbury for the last ten years documenting his life story. The backstories that had never been told, Bradbury opens his heart and life to the world through Weller first through The Bradbury Chronicles then through Listen to the Echoes: The Ray Bradbury Interviews. His unorganized faith in believing in oneself and not talking about things, just doing them. Just do. The thoughts of previous sexual encounters like Bradbury’s brief discussion of Bo Derek, reminds me of my grandfather in his dying days… maybe old guys like to rehash these moments. Bradbury’s extreme disgust and hate towards the internet and e-books. I’m not sure about technology as a whole, but for sure he is a bibliophile to the end. This discussion is one of the main factors of why I am not taking my computer with me on my two-week trip to England. I had the opportunity to ask a question about how he got involved in the Horton Plaza project. For those of you who don’t know, Bradbury helped in the design of Horton Plaza… he is the one to blame if you get lost, because that is the point. The answer came after he was requested to help with building design for the New York World’s Fair. Subsequently, he was asked to help with Epcot and en a number of other projects including Horton Plaza. In less than a month, Ray Bradbury turns 90; his mind still fresh with the memories of being born. He is a national treasure, one that often does not receive credit for his work. But as you go through life, you will find his influences abound, from the buildings you stand in, the flat screen monitors you stare at everyday to the ear buds for your iPod… these all had the markings of Bradbury. Without him, the world would not be as we know it.